Shri Sai Baba Sansthan Trust, Shirdi, is the Governing and Administrative body of Shri Sai Baba's Samadhi Temple known as “Samadhi Mandir”, temples in the premises, Dwarakamai, Chavadi, Gurusthan, Lendi Baug, Museum Hall, Hanuman Mandir, Tapobhoomi Mandir and many more that is present under its custody and also devoted towards development of Shirdi village. Shri Sai Baba Sansthan Trust, Shirdi, is the authorized body to control and manage the day-to-day activities at the Shri Sai Baba Samadhi Temple. It also provides various facilities like accommodation, Prasad Bhojan (at subsidized rate), refreshments, railway reservations, educational services, hospitals, blood bank and lot more. The Sansthan Trust also participates in the development of Shirdi Village. Shri Sai Baba Sansthan, Shirdi was established in the year 1921 exactly 3 years after the Samadhi of Shirdi Sai Baba on 15th October 1918, after obtaining due permission from Ahmed Nagar District Court to continue the legacy of Shri Sai Baba. “Shri Sai Leela” the official Magazine of Shri Sai Baba Sansthan Trust (Shirdi) was started in April 1923 as a Marathi Edition with Shri.Kaka Mahajani as the Chief Editor of the Magazine. The First Edition of “Shri Sai Satcharitra” written by Shri.Hemad Pant was published on 26th November 1930 by Shri.Ramachandra Atmaram Tarkhad. Shri.B.V.Narasimha Swamiji, the founder of All India Sai Samaj, Chennai started Sai Prachar in a very big way from the year 1939. This resulted in heavy influx of Sai Devotees from South India to Shirdi. Shri Sai Leela Magazine's publication was discontinued for a period of 3 years in the year 1944. It was again re-started in 1947. The Golden Kalash atop the Samadhi Mandir Rajagopuram was installed on 29th September 1952 at 11:00 AM by Dr. Ramachandra Prahlad Paranerakar Maharaj. The Marble Idol of Shri Sai Baba sculpted by Shri.B.V.Talim was installed on 7th October 1954 by Swami Sharananand. Shri Sai Baba Sansthan started Bi-lingual edition of Shri Sai Leela (Marathi and English/Hindi combined edition) from April 1973. The governing of Shri Sai Baba Sansthan was handed over to the Board of Trustees on 16th August 1984 and Dr.P.K.Sawant was appointed as Chairman for 4 years. Afterwards, Shri.M.R.Patil was made the Chairman for a term of 1 year. For overseeing the day-to-day activities of the Temple, an Executive Officer was also appointed. A New 25 Member Trust was formed on 1st September 1989 and Dr.Lekha Pathak was appointed as Chairperson of the Trust. On 4th May 1990 the Bhoomi Pooja of “Sai Baba Bhakta Niwas” was performed. A building to accommodate 3500 devotees, having 560 self-contained rooms and two spacious halls was constructed. Shri Sai Baba Sansthan increased the size of Bi-lingual edition of Shri Sai Leela (Marathi and English/Hindi combined edition) and started as a Bi-monthly Magazine from January-February 1991 issue onwards. A New Trust was formed on 1st September 1994 and Shri.D.M.Suktankar was appointed as Chairman of the Trust. The Samadhi Mandir Complex was completely renovated and Sathe Wada was demolished. A New Trust was formed on 23rd August 2004 and Shri.Jayant Muralidhar Sasane was appointed as Chairman of the Trust. Shri Sai Baba Hospital was inagurated on 15th May 2006 by the then Chief Minister of Maharashtra Late Shri.Vilas Rao Deshmukh. Newly built Asia’s biggest Prasadalaya was inaugurated on 27th November 2007. Newly built Accommodation Complex “Dwaravati Bhaktaniwas” was inaugurated on 14th January 2009. Foundation Stone for the Construction of "Shirdi Airport" was laid on 27th August 2010 by the Chief Minister of Maharashtra. The old trust was dissolved and a New Shri Sai Baba Sansthan Trust was formed on 30th March 2012 as per the directions of Aurangabad High Court and Ahmed Nagar District Judge, Shri.Jayant D.Kulkarni was appointed as Chairman of the Trust. Centenary Celebration of Paduka Installation at Gurusthan was performed on 1st August 2012. Shirdi Sai Baba Sansthan starts information centres at Mumbai, Chennai, Bangalore and Secunderabad in the month of August 2012. Shirdi Sai Trust, Chennai completes and hand-over all the buildings and facilities of the Sai Ashram Project I & II to Shri Sai Baba Sansthan, Shirdi on the auspicious day of Vijayadashmi on 24th October 2012. Shri Sai Baba Sansthan's Sai Ashram Phase-I accommodation facility inaugurated on 11th April 2013. Shri Sai Baba Sansthan's Sai Ashram Phase-II accommodation facility inaugurated on 18th July 2013. Shri Sai Baba Sansthan's Sai Prasadalaya gets ISO-22000-2005 certification on 13th October 2013. Shri Sai Baba Sansthan stop issuing free passes to all the 4 Aarti's and Darshan including VIP Category with effect from 18th November 2013. Shri Sai Baba Sansthan receives the Biggest Solar Steam Cooking Project Award from Ministry of Non-Conventional Energy, Government of India on 17th December 2013. Shri Sai Baba Sansthan's Shri Sainath Hospital completes 50 years and celebrates its Golden Jubliee on 14th May 2014. Bhoomi Pooja for the installation of Biogas Plant at Shri Sai Baba Sansthan run Sai Prasadalaya was held on 15th January 2015. Shri Sai Baba Sansthan's Accommodation Project gets the coveted ISO 9001:2008 Certification on Saturday, 24th January 2015. Five Temples inside the Samadhi Mandir Complex - namely Gurusthan Temple, Shani Temple, Ganapathi Temple, Mahadev Temple and Nanda Deep Temple covered with Gold plating due to the generous contribution of Sai Bhakt Vijay Kumar on Friday, 31st July 2015 on the auspicious day of Guru Poornima. Shri.K.V.Ramani, Chairman of Shirdi Sai Trust, Chennai inaugurated Bio Gas Plant with a capacity of generating 5 tons of Gas built at a cost of Rs.57.36 Lakhs in Shirdi on Friday, 2nd October 2015. Shri Sai Baba Sansthan Prasadalaya gets ISO 22000-2005 (Food Safety Standard) Re-Certification on Friday, 16th October 2015. Shri Sai Baba Sansthan starts the Digitalization of its Records Section on Tuesday, 23rd February 2016. Shri Sai Baba Junior College run under the auspices of Shri Sai Baba Sansthan starts Online Students Information Facility Centre on Wednesday, 13th April 2016. Shri Sai Baba Sansthan bags National Award from the Mnistry of Power and Energy, Government of India for its prestigious Solar Steam Cooking Project at Prasadalay on Friday, 29th April 2016. The Law and Judiciary Department of Government of Maharashtra appoints a New Trust with effect from Thursday, 28th July 2016 with Shri.Suresh Kashinath Haware as Chairman of the Trust for a period of 3 years. Shri Sai Baba Sansthan organizes Global Summit of All Sai Temple Trustees under the Chairmanship of Shri.Suresh Kashinath Haware on Sunday, 11th December 2016 in Shirdi. Shri Sai Baba Sansthan Chairman Shri.Suresh Kashinath Haware inagurates Biometric based Free Darshan Tickets (based on Time Slot) at a function held on Monday, 12th December 2016. Shirdi All India Radio FM Station was launched on Wednesday, 1st February 2017. Shri Sai Baba Sansthan's Accommodation Project gets ISO 9001:2008 Renewal Certification on Friday, 24th March 2017. Shri Sai Baba Sansthan organizes the first ever Shri Sai Sevak's Conference under the Chairmanship of Dr.Suresh Kashinath Haware on Wednesday, 14th June 2017 in Shirdi. Shri Sai Baba Sansthan organizes the first ever Media Conference under the Chairmanship of Dr.Suresh Haware on Sunday, 30th July 2017 in Shirdi. Shri Sai Baba Sansthan launches "Shri Sai Sevak Yojana" on the lines of the scheme prevalent at Shegaon Sansthan on Tuesday, 29th July 2017 in Shirdi. Shri Sai Sevak Mandal, Satara, Maharashtra were the lukcy first group to serve Sai Devotees at various places in Shirdi immediately after the launch of the ambitious Scheme. Chairman of Shri Sai Baba Sansthan Dr.Suresh Kashinath Haware inaugurates "Blood Donation Center" inside Shirdi Samadhi Mandir Temple Complex and set the ball rolling for Blood Donation on the lines of Hair Donation at Tirupati on Monday, 21st August 2017. Honorable President of India Shri.Ram Nath Kovind performed Flag Pooja and Flag Hoisting atop Flag Post specially erected at Lendi Baugh and officiallly inagurated the Centenary Celebration of Shri.Sai Baba's Maha Samadhi on Sunday, 1st October 2017. Honorable President of India Shri.Ram Nath Kovind officially inaugrated Shri Sai Baba International Airport at Kakadi Village, 15 KMS from Shirdi on Sunday, 1st October 2017. Shri Sai Baba Sansthan organizes 2nd Global Summit of All Sai Temple Trustees under the Chairmanship of Shri.Suresh Kashinath Haware on Saturday, 23rd December 2017 in Shirdi. Shri Sai Baba Sansthan organizes first ever Mega Blood Donation Camp at Sai Nagar Grounds, Shirdi on the lines of Hair Offering at Tirumala Tirupati on Saturday, 30th December 2017 in Shirdi. Shri Sai Baba Sansthan bestowed with United Kingdom's World Book of Records Certificate at a function held in Shirdi on Thursday, 18th January 2018. This certificate was given to Shri Sai Baba Sansthan under the category of Most visited religious place and Highest provider of religious services in the World. Shri Sai Baba Sansthan officially launches the android application for all Information and Services offered by it on Wednesday, 7th March 2018. Chairman of Shri Sai Baba Sansthan Dr.Suresh Haware inaugurated a separate Mukh Darshan Room on Saturday, 21st April 2018 to facilitate more devotees to have quick darshan of Shri Sai Baba. Shri Sai Baba Sansthan gets Government's nod to start a Senior College of Commerce, Arts and Science in the Temple town of Shirdi on Friday, 15th June 2018 and accordingly Sansthan begins admission process from Wednesday, 20th June 2018. Shri Sai Baba Senior College run under the auspices of Shri Sai Baba Sansthan Trust Shirdi was inaugurated on Tuesday, 17th July 2018. Chairman of Shri Sai Baba Sansthan Dr.Suresh Haware formally inaugurated the college. Chairman of Shri Sai Baba Sansthan Dr.Suresh Haware performed Bhoomi Pooja for the construction of Storage Water Lake in Shirdi on Tuesday, 17th July 2018. Shri Sai Baba Sansthan organizes Shri Sainatha Stavana Manjari Mass Parayan to commemorate its Centenary celebbration on Thursday, 13th September 2018. Shri Sainatha Stavana Manjari was composed by Sai Mahabhakta Late Shri.Das Ganu and personally blessed by Shri Sai Baba. Shri Sai Baba's Maha Samadhi Completes 100 years on Friday, 19th October 2018 (Vijaya Dashmi). To mark this auspicious and special occasion, Honorable Prime Minister of India Shri.Narendra Modi released Shri Sai Baba Maha Samadhi Centenary Celebration Commmemorative Silver Coin weighing 25 grams and priced at Rs.1825/-. Shri Sai Baba Sansthan Executive Officer Smt.Rubal Agarwal and Trustee Shri.Bhausaheb Wakchoure officially launches Sansthan's Mobile Application “Sai Baba Shirdi” on Republic day i.e, Saturday, 26th January 2019. Shri Sai Baba Sansthan in collaboration with IRCTC launches Shirdi Darshan Passes For E-Railway Tickets from Republic day i.e, Saturday, 26th January 2019. Shri Sai Baba Sansthan Trust (Shirdi) regularly celebrates Gudi Padawa, Shri Ramanavami, Shri Gurupoornima, Shri Sai Baba Punyatithi and Kojagiri Poornima Festivals every year in a very big way. More…..
Shri Sai Baba Sansthan is publishing the holy book “Shri Sai Satcharitra” based on the Life & Teachings of Shri Sai Baba written by Late Shri.Govind Raghunath alias Annasaheb Dabholkar (Hemadpant) in 14 Languages like English, Hindi, Marathi, Tamil,Telugu, Kannada, Bengali, Gujarathi, Sindhi, Oriya, Punjabi, Urdu, Nepali, Malayalam etc. Shri Saileela Magazine is an official periodical of Shri Sai Baba Sansthan Trust, Shirdi which is published bi-monthly and covers nearly all the activities of Shri Sai Baba Sansthan Trust. It also provides rich spiritual and religious information. Apart from “Shri Sai Satcharitra” and “Shri Saileela” Magazine more than 100 types of publications like books, photos, audio-video CD’s, diary, calendars etc. are also available for sale at the Sansthan. Considering the heavy influx of devotees from all over the Country and the world, the Sansthan Trust is giving utmost priority to the Accommodation of the Sai Devotees. Sansthan has built and has been maintaining many Accommodation Complexes in Shirdi. It is continuing to build many more Accommodation Complexes for the benefit of Sai Devotees. Many Sai Devotees come to Shirdi only for “Darshan” of Sai Baba and return home immediately afterwards. They, however, need to use the toilet facilities and freshen-up/bathe, as well as find a place to keep their belongings safely while visiting the temple. With these requirements in mind the Sansthan has made 120 Toilets and 108 Bathrooms available round-the-clock for Sai Devotees along with several other facilities. This complex is located behind the Saiprasad Bhaktaniwas and is run by Sulabh International. Sai Devotees may kindly note that there is no advance booking facility available for Sansthan Accommodations except for Dwarawati Bhaktaniwas. Sai Devotees are requested to approach the Enquiry Office, Accommodation Department once they arrive in Shirdi for getting Sansthan Accommodation. The Enquiry Office, Accommodation Department is situated opposite to Shirdi Bus Stand. For Booking Sansthan Accommodation Online, log on to https://online.sai.org.in. More…..
Shri Sai Baba Sansthan Trust has built what is billed to be Asia's biggest Prasadalaya, a Dining Hall with a seating capacity of 5,500, making it possible to feed more than 100,000 devotees daily. This Prasad is partaken by about 30,000-35,000 Sai devotees on a normal day, and by about 70,000-80,000 during festivals/vacations. Sri Sai Baba Sansthan Trust, on an average, spends Rs.190 million annually on feeding pilgrims visiting Shirdi. Approximately 1 Crore Sai Devotees are taking the Prasad Bhojan every year. More….. When Sai Baba came to Shirdi, He gave medicines to patients, but later He stopped it and started distributing Udi or Sacred Ash or Vibhuti obtained from the sacred fire that He lit as blessing and for healing. Udi is believed to take care of both material as well as spiritual well being of devotees. For lakhs of devotees who flock to Shirdi to have darshan of Sai Baba, Udi is equivalent to Elixir. Sai Devotees used to stand in queue for long hours to obtain a packet of Udi. Seeing the Devotee's faith in Udi, Shri Sai Baba Sansthan Trust has made special provision and has set up a separate department exclusively to manage distribution of Udi to devotees. The Holy Ash is prepared in Dwarakamai's Dhuni the fire being lit by Sai Baba Himself and burning even to this day. In order to provide smooth ash, it is sieved through the machines, packed in small plastic bags and is distributed through the Udi Distribution Centre set up next to Baby Feeding Room near Gate No.2. Sai Devotees who offer donation at the Donation Counters will also get a packet of Udi along with Donation Receipt. For those who send donation by way of Money Orders, Cheques, Demand Drafts, Online or through ATM, Udi will be sent by post. In addition, Udi along with festival inviation will be sent during all the 3 major festivals by post to General Members, Life Members and Patrons of Shri Sai Baba Sansthan. The Donation Counters distribute on an average 10,000 packets of Udi and Shuntiwad Prasad on a daily basis. On an average 1500-2000 Donation Receipts are made everyday. Thus on an average every year about 40-45 Lakh Packets of Udi and Shuntiwad Prasad is being distributed to Sai Devotees. The Machines which are used to pack and distribute Udi and Prasad in Plastic Bags is donated by a Sai Devotee by name Shri.Susheelbhai Ramani. He has also provided the Plastic Rolls for this purpose. Shri Sai Baba Sansthan prepares this Holy Ash by burning Cow Dung Cakes. The Dung cakes are brought from rural areas near Shirdi. They are burnt and the ash produced is first kept for cooling. Then with the help of strainers, it is sieved and packed in small plastic packets and then distributed to devotees. Shri Sai Baba Sansthan is distributing Bundi/Ladu Prasad both freely and as well as with minimum charges to Sai Devotees. In the earlier days, Ladu was being prepared at Shri Sai Prasadalaya. However, considering the huge demand for Ladu Prasad, a separate Ladu Prasad Department was started by Shri Sai Baba Sansthan on 3rd January 2014. The Canteen Department distributes free Bundi Prasad to all the Sai Devotees in the Darshan Queue in the Samadhi Mandir. For those Sai Devotees who want to take Ladu Packets as prasad to their houses as for General Public, the Ladu Prasad is being distributed at Rs.20/- Per Packet consisting of 3 Ladus. Each Ladu weighs about 50 grams. The Ladu Prasad Counters have been set up at Sai Prasad Building opposite to Gate No.1. Ladu is made using Chik Pea Gram Flour, Sugar, Ghee, Dry Fruits, Cashew-Nuts, Cardamom, Edible Colour. These Ladus are being packed using laminated Paper Bags. On an average 20,000 - 25,000 Ladu Packets are sold in a day. Similarly, Bundi with a net weight of 100 grams is packed in a laminated Paper Bag and distributed freely to all the Sai Devotees near Gurusthan after the devotees finish their darshan and come out of the Samadhi Mandir. Daily on an average, about 45,000 to 50,000 Bundi Packets are being distributed. During holidays and festival occasions, there will be huge increase in the freely distribued Bundi Packets as well as Sale of Ladu Packets. Refreshment Centre near Gate No.2. Refreshment Centre near the Sansthan Office Complex. The Canteen is open 24 hours-a-day with minimum break timings and sells tea, coffee, milk, break-fast packets, Mineral Water, Laddu Prasad etc. Infant’s Mother (below 1 year child’s mother), Old people, Handicapped persons and Patients can avail direct darshan along with their family. It is also decided to keep a doctor and some medicines In Darshan Queue for the devotees who are standing for long time. To provide proper ventilation and air circulation in Darshan Hall it is decided to change the windows and provide more fans in Darshan Queue. It is also decided to make Air conditioned Queue hall and to keep “RO Water purifier plant ” to make devotees feel comfortable. Pure Drinking water is being distributed. Tea, coffee, milk, biscuits are being given free of charge to all the devotees. Considering the increasing crowd coming to have darshan of Shri Sai Baba, to have easy and smooth darshan for the devotees without spending much time in Darshan Queue, Sansthan Management Committee implemented Planned Darshan based on the lines of Tirupati from Monday, 12th December 2016. The Biometric based Free Darshan Access card (Time Slot) is issued 24x7 for Sai Devotees through counters at Sai Ashram Bhaktaniwas, Sai Baba Bhakta Niwasasthan, Dwaravati Bhakta Niwas and Sai Dharmashala. Sai devotees can avail free Darshan access card (time slot) and report for Sai Darshan at gate No.1 or Gate No.2 of Darshan `Q' in the mentioned slot only. Management Committee has decided to apply Chandan on the foreheads of each devotee who are coming to have Darshan of Shri Sai Baba. Due to the ever increasing crowd coming to have darshan of Shri Sai Baba, the current Queue system is not able to manage and is not sufficient. Hence there is a plan of renovating the Temple premises and Old prasadalay. This includes joing of old prasadalay into temple premises. There is a plan of building 12 Halls in new Queue complex in 1st and 2nd Floor with a capacity of 2500 people in each hall, all put together 30,000 people at a time in new Queue complex. In the new Queue complex, 3 main entrance hall, Toilet block, Information centre, Ladu distribution centre, Udi distribution centre, Donation counter, ATM faciltiy, Book Sale counters, Baby Feeding Rooms, KIOSK, First aid centre, 55 thousand lockers to keep Mobile and Footwear are being planned . Every day nearly 40,000 to 50,000 Devotees from different parts of Country & World are taking darshan of Shri Sai Baba. Earlier all the devotees were using Free/ General Darshan Queue for availing Shri Sai Baba’s Samadhi Darshan. Later on, the demand for availing VIP passes was increasing day by day. Earlier VIP Darshan/Aarti passes were being issued through Online Service. Now, for the benefit of Sai Devotees who are staying in various Bhakti Nivas & for the Devotes who are taking Sai Prasad Bhojan at VIP Dining Hall, New VIP Aarti/Darshan Pass Counters have been started at Shri Sai Bhakti Nivas, Dwaravati Bhakti Nivas, Sai Ashram Bhakti Nivas, 1 & 2 with effect from 1st of March 2016. Shri Sai Baba used to give the sacred “Udi” to cure ailing patients during his sojourn in Shirdi. The noble task of treating the sick is being continued by the Sansthan’s Board of Trustees through the medium of the Shri Sai Baba Super Specialty Hospital and the Shri Sainath Hospital. Shri Sainath Hospital was established in the year 1964 in Shirdi. The hospital serves nearly 1000 out-patients a day and accommodates nearly 200 in-patients. All services and medicines for various ailments are provided at very economical rates. The Hospital has all the modern facilities and equipments. Shri Sai Baba Super Specialty Hospital has 206 beds and has all super specialty facilities. The Public Health Department of Maharashtra has accorded this hospital the grade of a Life-Saving Unit. Patients from low income group and Below Poverty Line get concessions for all heart operations. The hospital also runs a “Blood Bank” to serve poor patients. The Sansthan provides financial aid to the needy and low-income group patients for costly treatments and operations like heart surgery, neuro-surgery, cancer treatment, kidney treatment & transplant etc. These patients could even be from Government/ Semi Government / Trust Hospitals. The Sansthan is receiving large number of requests for such aid. A sum of Rs.20,000/- or 15% of the expenditure, whichever is less, is granted by the Sansthan to the patient for treatment/surgery. Due to increase inflow of patients at Shri Sainath Hospital and Sai Baba Hospital, more beds needs to be accommodated. Hence, it was decided to award contract to architects to build a new building at the free space available near west side of the hospital at the survey no 148. Shri Sai Baba Sansthan started the Industrial Training Institute in 1984 to impart Job-oriented professional training to poor students from areas in and around Shirdi, so that they could earn and support their families. The Institute runs in two shifts and has a total strength of more than 400 students. The Government of Maharashtra has rated this Institute as “A” Grade and is ranked 1st in the State. The students of the Institute are also provided with meals at subsidized rates at Sai Prasadalaya. The Sansthan Trust started Shri Sai Baba Marathi Kanya Vidya Mandir Girls School in the year 1993 has more than 600 girl-students. Shri Sai Baba English Medium School which was started in the year 1990 has more than 1500 students and the Junior College for Science, Commerce & Arts started in the year 2000 has more than 900 students. Under Educational Project currently Sai Baba Junior College, Shri Sai Baba Industrial Training Center, Shri Sai Baba Girls School, Shri Sai Baba English Medium School are running. In future, there are plans top commence Senior College, Skill Development Programmes, University, E-Projects. Also there is a plan to make most advanced education systems amongst all the institutions in the coming days. A huge building will be constructed and all the educational activities will be transferred to the new building. 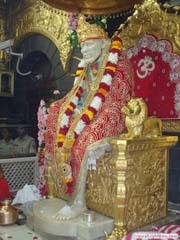 Shri Sai Baba Sansthan Trust has developed its website in Marathi, Hindi and English titled www.sai.org.in. Shri Sai Satcharitra in 10 langagues, Shri Saileela Magazine from 1923 and many more information are available here for the benefit of Sai Devotees. Live Darshan of Sai Baba is also available from Sansthan Website. Shri Sai Baba Sansthan Trust has started the “Shri Sai Sampurna Suraksha Kavach Apaghat Vima Sanrakshan” for the security of devotees coming to Shirdi for Baba’s Darshan. In case of an unfortunate incident resulting in injury or death within the temple premises, Darshan queue, Prasadalaya, Sainiwas Guest House, Caravanserai, New Bhaktaniwas and on the road along the temple, devotees will get compensation under this policy. A Computerized Railway Booking Office is in operation by Railway Department near the Parayan Hall. Sai Devotees can book tickets to travel anywhere in India. They can also check the reservation status of tickets already booked. This Reservation Counter is open from 08.00 am to 08.00 pm with minimum break-timings. Up and Down train services from Mumbai, Vishakapatnam, Hyderabad, Chennai, Bangalore and many more places are available to all the above railway stations. Shri Sai Baba Sansthan Trust runs regular bus services from Kopargaon, Shrirampur, Nagarsul and Manmad Railway Stations. The Airport at Aurangabad about 100 Kms from Shirdi has flights for Delhi and Mumbai. Flights can also be taken from/till Pune (200 Kms away) and Mumbai (290 Kms away) to visit Shirdi. The Airport Authority of the Maharashtra Government had taken an initiative to establish an International Airport in Shirdi. The work on this 300 Crores project which was started at Kakadi village, about 15 Kms from Shirdi on an area of over 600 acres got almost completed. And, Honorable President of India Shri.Ram Nath Kovind officially inaugrated Shri Sai Baba International Airport at Kakadi Village, on Sunday, 1st October 2017. At present, Mumbai is connected with two flights on a daily basis. In phased manner, other prominent cities will be connected with Shirdi shortly. This ambitious project of Shri Sai Baba Sansthan taken up at a cost of Rs.25 Crores aims to deliver high quality devotee focused services under one roof in Shirdi and at Remote Information Centres in India and abroad. This project aims to bring transparency in Sansthan’s Management and Administration. It also helps to enhance decision making by the use of Information Technology. This project includes the existing 24 x 7 maintenance and support by a well known IT Service Provider. They will deliver a total of 36 Applications in 6 phases for 32 IT Services. The Total Cost of the project is Rs.25 Crores out of which Rs.22 Crore is spent for IT Solution and Rs.3 Crore is spent for IT Infrastructure development. The 1st Phase of the applications was implemented on the auspicious day of Gurupoornima on 15th July 2011. Sai Devotees can now make Online Booking for Darshan, Aarti, Accommodation, Donation, Annadan etc through the website https://online.sai.org.in. Under Sai Creation Project, it is planned to show Baba’s life history right from Baba arrived in Shirdi till Mahasamadhi through POP models with Lights and Audio systems. Also there is a plan to start Library and Mediation hall for the benefit of Sai Devotees. To provide more facilities to Sai devotees, there is a proposal to start “Sai City”. This will mainly consist of Theme park, Entertainment Park, Healing Hub, Spiritual Centre, Mediation Centre, Ayurvedic Therapy Centre, Landscaping Park and Cottages, Resorts etc. M/s.Tata Consulting Engineers, Mumbai have already created a layout plan to develop this project. There will a Laser show based on Baba’s life history for the benefit of Sai devotees coming from all over the World. Also there will be entertainment for Sai devotees in Sai Garden through laser shows but at the same time Baba’s teachings will be shown. Contract for Laser show has been awarded to M/s.Laser Vision Ltd, Hongkong. To facilitate dissemination of more information about Shirdi Sai Baba and Shirdi Sai Baba Sansthan, two Touch Screen Machines have been installed in the Temple Premises. Devotees can get information about Bhaktaniwas Complex, Publications, Bus & Train Timetables etc. with the help of these kiosks which are open from 06.00 am till 10.00 pm. Devotees can now get Darshan of Shri Sai Baba from their homes. Devotees throughout the world can now view the direct telecast from Shri Sai Baba’s Samadhi Mandir daily from 04.00 am to 11.00 pm by availing the Tata Sky DTH connection. To Guide all Sai Devotees www.sai.org.in website will be updated regularly and a new mobile application will be started very soon. In this App various activities of Sansthan, Contribution made by devotees information, various facilities provided by Sansthan, and the information on various Religious programmes held by Sansthan through out the year will be made available. It is decided to provide free WI-FI facility at various Sansthan’s accomodation places and Sai Prasadalay. Nearly 1500 poor are fed free every day, also 20,000 Sai devotees take benefit of taking meal in the prasadalaya run at concessionary rates. The fund is used for the expenditure of the Prasadalaya on annadan daily. Donations are always accepted under this head. Sansthan Trust has started various educational institutions to give better and up-to-date educational facility to the poor but clever students of the Shirdi surroundings. Fund is used for the development and administration of these institutions. Donations are always accepted under this head. Donation is accepted with objective that the needy patients of Shirdi and surroundings rural area should get modern & up-to-date medical facility at affordable rates. Sansthan Trust is running general & super specialty hospital for providing medical facilities to rural people. The fund is collected with the co-operations of the Andhra Bank. Total fund is deposited in the same bank. The interest is used for the above expenditure. Donations are always accepted. This fund is started to complete the public works and to make more facilities available to Sai devotees. Donations are always accepted in this fund. To provide more facilities to Sai devotees, Sansthan Trust continuously perform expansion/ construction of various buildings. (Note : The entire amount donated to the above funds are eligible for Income Tax deduction u/s 80-G of Income Tax Act 1961). Daily Abhishek Pooja of Shri Sai Statue is done by Sansthan Trust on behalf of Sai devotees. Besides this collective Abhishek Pooja's are done in the Abhishek Hall by the devotees. For this pooja Rs. 101 are charged for every couple (Husband-wife). Pooja material is supplied by the Sansthan Trust. Donation is also accepted for Abhishek fund. Every day Naivedya is offered to Shri Sai Baba in the temple. Donation is accepted for this purpose. Shri Ramnavami, Shri Gurupournima and Shri Sai Baba Punyatithi are celebrated by Sansthan Trust in Shirdi every year. For those expenditures, donation is accepted in this fund. Daily Pooja is performed in Samadhi Temple, Dwarkamai, Gurusthan and Chawadi. This fund is used for pooja material of this pooja. Donation is always accepted in this Fund. Sansthan Trust arranges daily satyavrat pooja of Shri Sai Baba in the morning i.e. 8.00 am to 9.00 am and 10.30 am to 11.30 am. Rs. 100/- are charged for this for a couple (Husband-wife). Pooja material is supplied by the Sansthan Trust. Donation is also accepted for this purpose. (Note : The Income Tax deduction under section 80-G is not applicable for the amount of donation for these religious funds). Shri Sai Baba Sansthan Trust, Shirdi has developed the Windmill Energy Project worth Rs.15 Crores at Bhoyare Pathar in Ahmednagar District. This has a power generation capacity of 2.5 Mega Watts. Apart from Tirupati, Shirdi is the only pilgrim centre in the country which produces electricity for its own consumption. According to the Maharashtra Energy Development Agency, Pune (MEDA), a total of 52 lakh units of energy is produced under this project annually. Shri Sai Baba Sansthan has got international recognition as well as carbon credit for this project. Sansthan hopes to recover the investment cost within the next seven years. The Sansthan is spending Rupees 8 Crores for the development of new Shirdi Bus Stand with all modern facilities like 14 Platforms, Information Centre, Dormitory Hall, Canteen, Toilet Blocks, Shops, Rest-Rooms for Drivers/Conductors etc. Sansthan Trust has paid Rupees 15 Lakhs for the development of Drinking Water Scheme for Shirdi Village. Sansthan is using water from Kankuri Lake situated on the right side canal of Godavari. .In future it is planned to take water from Nilvande Dam permanently. It has been planned to put up a new pipe line and take water from Nilvande Dam. Under this project, it is planned to set up 80 kms pipeline with the capacity of 23 MLD along with water purification plant. Shri Sai Baba Sansthan Trust is in the process of implementing a Bhaktaniwas Project in the Sansthan area to provide more accommodation for the devotees. Under this project specific donations of minimum Rs.1 lakh are accepted on a waiting basis. The project fund for each room is approximately Rs.5 lakhs. Rooms with attached toilet & bathroom, Allotment of rooms on a first-come-first-served basis, Modern facilities for all rooms as well as spacious parking space, Free Stay facility for the Donors as per the Trust’s policy are some of the highlights of this project. There is a plan of making an underground pass of 1 meter wide and 30 meter length in 5 places for the benefit of devotees and shirdi local residents to cross on the high way of Nagar-Manmad passing Shirdi at Prasadalay, Old Pimpalwadi Road, New Pimpalwadi Road, near Shirdi Bus stand and infront of Bhakti Nivas. This project started by Shri Sai Baba Sansthan Trust, Shirdi has been approved by the National Committee for Promotion of Social and Economic Welfare, Department of Revenue, Ministry of Finance, Government of India, New Delhi under Section 35AC of the Income Tax Act vide notification No.S.O.1473 (E) dated 17th June 2008. Sai Garden Theme Park with Laservision Show on 20 acres owned by Sansthan at Nimgaon-Korhale Village near Shirdi. Temple Premises Re-Development and Queue Arrangements. New Super Specialty Hospital with all modern facilities with a capacity of 600 beds at Nandurkhi near Shirdi. Sai Devotees can contact the below mentioned Information Centres run by Shri Sai Baba Sansthan Trust (Shirdi) for availing Darshan/ Aarti Passes, Accommodation, Donation, Books published by Sansthan and other services. Sai Niketan, 803-13, Dr.Ambedkar Road, Dadar, Mumbai-400 014, Maharashtra, India. Pattipulam Post-603 104, Chennai, Tamilnadu, India. Malleswaram, Bangalore-560 003, Karnataka, India. Unit No.25, Ground Floor, Deepti House, YMCA Complex, Sardar Patel Road, Secunderabad, Andhra Pradesh, India. Shri Sai Baba Sansthan Trust (Shirdi) plans to start information Centers in cities of Raipur, Jaipur, Lucknow, Calcutta, Amaravati (Telangana State), Vijayawada, Shimla, Itanagar, Guwahati, Patna, Panaji, Ranchi, Bhopal, Trivandrum, Deharadun, Agartala, Bhubaneshwar and other places in the Country. The centers should have a minimum of 500 Square Feet of area and should be provided free of cost by the concerned Temples/Trust. Those Temples/Trusts who would like to join hands with Sansthan can contact sai.publicity@sai.org.in or call 02423-258778/258775. Canara Bank 1st Floor, Shopping Complex, No.2, Nagar Panchayat, Nagar-Manmad Road, Shirdi-423 109. Phone: 02423-258 101. IDBI Bank Limited Hotel Kala Sai Building, Opp. Shirdi Police Station, Nagar-Manmad Road, Shirdi-423 109.Taluk:Rahata, District:Ahmednagar, Maharashtra.Phone: 02423-257 104 /257 105. State Bank Of India #802, Sainath Chhaya, 1st Floor, C S No.323, Shirdi-423 109, Taluk:Rahata, District:Ahmednagar, Maharashtra.Phone: 02423-256 835. Vijaya Bank Hotel Saish Private Limited, Pimpalwadi Road, Shirdi-423 109. Taluk:Rahata, District:Ahmednagar, Maharashtra. Bank Of India Hotel Shanti Kamal, Near Sai Bhakti Niwas, Survey No.109/1/2, CTS 812(P), Ground Floor, Nagar-Manmad Road, Shirdi-423 109.Taluk:Rahata, District:Ahmednagar, Maharashtra. Phone: 02423-257 370. Bank Of Baroda Shirdi-423 109. Taluk:Rahata District:Ahmednagar, Maharashtra. Nagar-Manmad Road, Next to Hotel Sai Plaza, Near Bus Stand, Shirdi-423 109. Taluk:Rahata District:Ahmednagar, Maharashtra. Sainath Hospital Blood Bank Near Sai Dwarawati Guest House, Shirdi-423 109. Taluk:Rahata, District:Ahmednagar, Maharashtra. Phone: 02423-258 794. Apollo Pharmacy Malmatta No.865, R.M.O.Quarters, Ground Floor, Shree Sainath Super Specialty Hospital Complex, Shirdi-423 109. Taluk:Rahata, District:Ahmednagar, Maharashtra. Phone: 02423-257 804.